We want to remind you that we’re hosting a game jam with 10,000 installs as the main prize, along with a bunch of other cool stuff! If you’re working on a new game in Corona, this is a great way to get additional promotion (and a bit of motivation, of course). Also, we are planning on featuring some of your games during this jam. If you have already registered to take part, please go ahead and set up your itch.io page, publish an alpha/beta “prototype” of what you’re working on, and let us know about it! 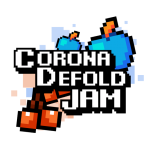 You can do so by posting your itch.io page to either the #gamejams channel in the Corona Developer Network on Slack (click here to join), or reply directly to this forum thread. We look forward to seeing your creations! The jam runs until October 1, 2017, so there is still time to join the fun!